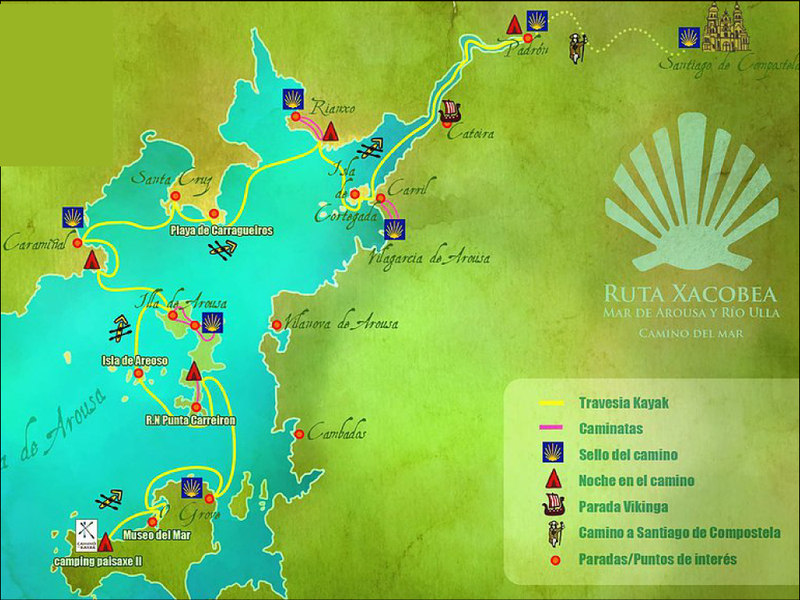 Kayak the Camino de Santiago through the Bay of Arousa and along the River Ulla. It's a one of a kind sea and river itinerary that celebrates the Apostle Santigo's body arriving to Galicia by sea. This route consists of sea kayaking the first 77 km and walking the remaining 25 km. route on foot. The end of this Camino also treats travelers to two nights in Santiago to fully enjoy this magnificent city and its festive atmosphere. The Camino de Santiago by Kayak is also called the Camino of the Sea. It's a true pleasure for all the senses and a unique travel experience - you wil free tranquil and free of traffic jams. Ancient Christian traditions and several medieval texts, the most important of them, the Book III of the Codex Calixtino, assure us that the bodily remains of the Apostle Santiago was transported from the Port of Jaffa in Palestine along the Mediterranean and the Iberian Atlantic Coast to the boundaries of the Western World, where he had preached the gospel. This route is also known as the "Traslatio". The body of Santiago passed through the Arousa Estuary and went upstream the Ulla River until the remains of Santiago arrived at Padrón. From there, the body was later transfered to Santiago de Compostela. Ahead of you you'll discover forty nautical miles (77km) until reaching the ancient Iria Flavia and then some 25 kilometers more walking the remainder of the way to Santiago de Compostela. These last km on foot coincide with the final stage of the Portuguese Camino (Way). Beaches of white sand and turquoise waters will almost convince you, that you are in the Caribbean itself. Carlos, one of the guides, is an excellent cook who has worked with some of the best chefs in this country and with him you will be able enjoy succulent delicacies cooked using local products offered only in these waters and lands. No previous ocean kayaking experience is necessary, but you must know how to swim and be relatively fit and in healthy condition. The Sea Route is designed to begin easy and increase in difficulty as you go along. That way you can gradually adapt yourself to kayaking and the effort it requires. Kayaking the Camino de Santiago provides an amazing activity in and of itself, but we also include additional activities such as snorkeling in the best areas of the Ria, hiking in Cortegada National Park or in some of the other numerous nature reserves, rapala lure or troll fishing from the kayak, and visiting some of the most emblematic places on the Camino. This area is famous for its many gastronomic and popular festivals, depending on the time and if your trip coincides with these, there will be organized visits to participate in them. One of the highlights of kayaking the Camino de Santiago is the amazing gastronomy of the area. On this route you will enjoy delicious cuisine, which will strengthen and revitalize you. In general, the conditions for kayaking are always optimal since the Sea Inlet (Ría) of Arousa is sheltered by the beautiful Illa de Sálvora. However, it is possible that occasional bad weather will change the conditions for kayaking, so that sea navegation isn't advisable. In this case, we reserve the right to suspend the voyage. Depending on which side of the river you are (A Coruña or Pontevedra) we will look for an alternative route for you to continue your Camino. If the conditions are not suitable during the entire week, we can cancel the Camino de Santiago by Kayak and exchange the route for an alternative during those days. The "Traslatio" is also the name of the certificate that verifies you have fulfilled the Camino by Sea requirement and is the one that you will receive when you arrive to Padrón, as long as you have completed a minimum of 40 nautical miles and you have stamped your "credential" in at least three towns or cities between the Provinces of Pontevedra and Coruña. The "credencial" is the paper you will pick up at the town hall of O Grove and you stamp as you move from town to town along the Camino. When you arrive to Padrón, you will present it to the "Pilgrim's Office" and you will then be entitled to the "Traslatio". You must bring a swimsuit, a synthetic or Lycra shirt for sailing, hat, sunglasses with an attached cord, in order not to lose them, water shoes, walking shoes, a small backpack, sun protection and a towel. Finally, remember a lightweight sleeping bag, and spare, warm clothes. Each kayak will carry your tent (provided by us), an inflatable expedition mattress, sleeping bag and a plastic container for clothes. Arrive to San Vicente del Grove where you meet your guide and the rest of the group. Dinner will be in a "Furancho", which is a secret restaurant in Galicia. You will sleep in a bed at the campsite. After a campsite breakfast you will go to where your equipment is being organized and distributed. Once everything is ready, you begin your journey heading towards El Grove, where you will eat in a typical fisherman's restaurant. This is the spot where you will receive your first stamp for the "Traslatio". After lunch you continue on towards the Arosa Island. In the evening you will enjoy a "seafood platter" at the beach bar and stay overnight in a tent on the island's camping grounds. Day 3: Arousa Island, Carreiron Natural Park, Areoso Islet, Area Secada (Arousa Lighthouse), Cabio Point. Today you'll have breakfast at the campsite and then head out to the Caribbean-style Areoso Island, and its 360 degrees of sandy, white beaches. From there, you will proceed to Area Secada to power up at the beach bar with a magnificent homemade meal. After lunch, visit the Arousa Lighthouse. Later, in the afternoon, you will continue your journey onwards to Punta Cabio. Dinner and tent accommodations tonight are at the campsite. After having breakfast at the campsite, your trip to Rianxo begins after you have breakfast at the campsite. The first stop is in Pobla do Caramiñal where you will taste a vermouth and tapita in the historical center of town. Once you've recharged, follow the path to Cabo de Cruz where you'll have lunch at the nautical club. Afterwards, return to the kayaks to take in an afternoon of fishing and snorkeling in the various islets. Once you arrive to Rianxo you'll eat again, a barbecue dinner this time. Your sleeping accommodation is a bed at the campsite. Day 5: Rianxo, Isla de Cortegada (National Parkl), Catira, Pontecesures, Padrón. Return to your kayak after breakfast. On today's journey you will pass by Cortegada Island, navegating through its famous clam and cockle farms. Once on the island (a National Park), you will take a short walk to explore it and have a picnic. The route continues to Catoira where you will eat again and be able to visit the Viking Towers. By kayak you'll navigate alongside Viking ships. After your meal you will leave the salty waters of the sea and enter into the fresh waters of the Ulla River. Here your journey in kayak ends and it is necessary to put on your hiking boots to walk to Padrón. Today, after breakfast your walk begins. You will walk the last stage of the Portuguese Way, 25 km enjoying the atmosphere of the Camino and arriving at the finish line in Santiago de Compostela. Once you arrive to Santiago, you will celebrate the moment with a "pulpada" (octopus dish) and then enjoy visiting the beautiful Cathedral. After the visit, your trip has ended and you will go to your hotel in Santiago. If you have left luggage in Padrón, you will find it waiting for you at the hotel. An entire day set aside to fully enjoy the city of Santiago de Compostela. 7 nights with 5 nights in route sleeping at different campsites either tent camping or in cabins (overnight in Padrón will be in Albergue for Pilgrims for our group only) and two nights in a charming hotel in Santiago de Compostela's centre. 3 meals a day during the 5 days in route as well as snacks. Tent and mattress for the nights tent camping. Various activities along the way, such as snorkeling, kayak fishing, hiking... etc. Personalized guidebook with maps, recommendations of best places to visit such as restaurants and other places of interest. There is one guide per every 4 people. Extra copies can be purchased. Local transport such as from the airport to the hotel and vice- versa. If you travel alone, it doens't mean that you will sail in a kayak on you own. The kayak is always for 2 persons. Its not possible to buy single kayak supplement. Transport up to the departure point and from the final point of any along the way, as well as fun and interesting experiences. Just ask, we are delighted to help you. Prolong your stay, in Santiago or any other spot north of Spain. Excursion to Finisterre from Santiago. Cancellation insurance: 6% total the price of the trip. (You can add it when you purchase your trip). If you leave your car in San Vicente del Grove we can take you to it.